This is an adaptation of my Sock Monkey pattern. 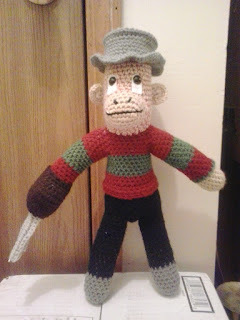 Freddy Krueger Sock Monkey continues the series of sock monkey dolls that my boss has asked me to make him. Worsted weight yarn: Buff, greybeard, dark sage, burgundy, buff, coffee brown, white, black, and gray. Rds 4-9: sc in each sc around. (15) Change to dark sage after Rd 9. Rds 2-5: sc in each sc around. (15) Change to dark sage after Rd 5. Rds 6-11: sc in each sc around. (15) Change to burgundy after Rd 11. Finish off. Weave in ends. Stuff LEFT ARM firmly. Rds 4-14: sc in each sc around. (15) Change to dark sage after Rd 14. Rds 15-20: sc in each sc around. (15) Change to burgundy after Rd 20. Finish off. Weave in ends. Stuff RIGHT ARM firmly. Finish off. Weave in ends. Place marker around sc #11. Rds 4-9: sc in each sc around. (15) Change to black after Rd 9. Rd 3: sc in next 3 sc, holding next sc on BODY together with first sc on LEG and working through both thicknesses, sc in next 3 sc, sc in next 3 sc on BODY, holding next sc on BODY together with first sc on LEG and working through both thicknesses, sc in next 3 sc. Rd 9: sc in next sc, holding next sc on BODY together with first sc of TAIL and working through both thicknesses, sc in next 4 sc, sc in next 25 sc on BODY. Rds 11-12: sc in each sc around. (30) Change to burgundy after Rd 12. WORKING ON BOTTOM EDGE OF SHIRT. WORKING ON TOP OF BODY AND HEAD. Rds 14-15: sc in each sc around. (30) Change to dark sage after Rd 15. Rds 16-20: sc in each sc around. (30) Change to burgundy after Rd 20. Rd 21: holding first sc on ARM and next sc on BODY together and working through both thicknesses, sc in next 2 sc, sc in next 10 sc on BODY, holding first sc on ARM and next sc on BODY together and working through both thicknesses, sc in next 5 sc, sc in next 10 sc on BODY, holding next sc on BODY and st #13 on ARM and working through both thicknesses, sc in next 3 sc, slip in next 2 sc. YOU WILL STOP TWO SC PAST THE STARTING SC. Rd 22: sc2tog, sc in next 7 sc, sc together next sc on BODY and first skipped on ARM, working behind same ARM, sc in next sc, ch 3, skip next 3 sc, sc in next sc, skip next 8 sc on same ARM, sc together next sc on ARM and next sc on BODY, sc in next 8 sc on BODY, sc together next sc on BODY and first skipped sc on ARM, working behind same ARM, sc in next sc, ch 3, skip next 3 sc, sc in next sc, skip next 8 sc on same ARM, sc in next sc on ARM. Rd 23: sc2tog, sc in next 6 sc, sc together next sc on BODY and next skipped sc on ARM, working behind same ARM, sc in next sc, ch 4, sc in next sc, skip next 6 sc on same ARM, sc together next sc ARM and next sc on BODY, sc in next 8 sc, sc together next sc on BODY and next skipped sc on ARM, working behind same ARM, sc in next sc, ch 4, sc in next sc, skip next 6 sc on same ARM, sc in next sc, sc in next sc on BODY. Rd 24: sc2tog, sc in next 5 sc, sc together next sc on BODY and next skipped sc on ARM, working behind same ARM, sc in next sc, ch 5, sc in next sc, skip next 4 sc on same ARM, sc together next on ARM and next sc on BODY, sc together next sc on BODY and next skipped sc on ARM, working behind same ARM, sc in next sc, ch 5, sc in next sc, skip next 4 sc on same ARM, sc in next sc, sc in next 2 sc on BODY. Rd 26: (sc in next 4 sc, sc2tog) around. (20) Change to buff and red crochet cotton. BEGIN STUFFING BODY FIRMLY AT THIS POINT. Rd 29: sc in next 13 sc, holding next sc of BODY and marked sc on MUZZLE together and working through both thicknesses, sc in next 10 sc, sc in next 7 sc on BODY. Rd 30: sc in next 13 sc, sc in next skipped sc on MUZZLE, working behind MUZZLE, sc in next sc, ch 8, skip next 8 sc, sc in next sc, skip next 14 sc on MUZZLE, sc in next sc, sc in next 7 sc on BODY. Rd 31: sc in next 12 sc, sc2tog, sc in next skipped sc on MUZZLE, working behind MUZZLE, sc in next sc, ch 9, sc in next sc, skip next 12 sc on MUZZLE, sc in next sc, sc2tog on BODY, sc in next 6 sc. Rd 32: sc in next 12 sc, sc2tog, sc in next skipped sc on MUZZLE, working behind MUZZLE, sc in next sc, ch 9, sc in next sc, skip next 10 sc on MUZZLE, sc in next sc, sc2tog on BODY, sc in next 6 sc. INSERT SAFETY EYES WITH 4 SC BETWEEN EACH EYE. Finish off leaving a long tail. Weave tail through sc of Rd 47, pull tightly and secure. Weave in ends. Using black, embroider MOUTH and NOSTRILS on MUZZLE. Finish off leaving a long tail. Sew GLOVE to RIGHT ARM adding stuffing to thumb area before closing. Finish off leaving a long tail. Sew CLAWS to GLOVE. Finish off. Weave in ends. 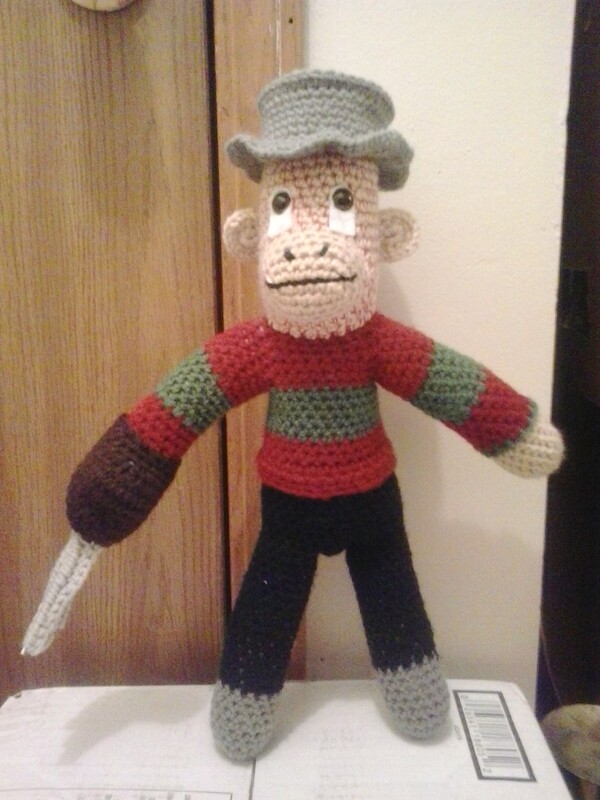 Place HAT on FREDDY KRUEGER SOCK MONKEY and sew it in place. Freddy Krueger is copyright Wes Craven and New Line Cinema Corp and their respective creators.